The Avengers International Fan Forum :: View topic - Any Avengers Fan-Films? Posted: Sun Jan 25, 2009 5:21 am Post subject: Any Avengers Fan-Films? I know there are Star Trek fan films (the most successful of which, the Phase II films, have featured actors from the original series), and I know there have been plenty of Doctor Who films (I've even seen one of these, Jon Blum's Time Riff, and it was pretty good)... so the question I'd have for the board is, are there any Avenger's Fan Films? A general Fan Film article on Wikipedia! I've never thought about it. There's never been an Avengers fan film has there? Posted: Mon Jan 26, 2009 8:10 am Post subject: fan movie ? was it any good ? etc ? Wasn't this just an advertising gimic for the action figures? I believe that TAF's Young Avenger did a remake of Invasion fo the Earthmen back in his prep school days. Never saw it myself though. Steed and Emma go missing, so new wet-behind-the-ears agents are sent out to look for them, following a trail of clues and familiar surroundings in "Missing in Action?" Excellent version of Invasion of the Earthmen, considering it is an amateur production. The guys tried to play, their mannerisms and approach is not boring, you get a feeling for their characters. Classic series style is available, that there worth is only one scene "Mrs. Peel, you're needed". Especially I liked the prologue, camera work at a such level I thought at first that watching a professional movie. Sometimes it does even better feeling for the atmosphere and mystery than the original. Many thanks to Joseph Lloyd, memorable Steed. It would be great to see another Avengers episode from this team, but as Joseph narrated in the Avengerworld book - it was a hard way to do it. And how! I think that there could be other Avengers fan films at the time, just things do not always come to light if the production quality makes the people who taking part in it, to make a decision on the possibility not to mention it publicly. As whole, this important aspect can be attributed to any fan-creativity at all. When I writing the memoirs for Avengerworld book, I realized that I could not tell even one tenth of what I could tell about Russian fandom, development of television in the USSR and other things, so I really very squeezed the content. I remember the discussion with Alan on topic "potentional volume of my essay" and as result there come to point, that the actually it would be easier if I released a separate book about it, than to try to tell all important things. One of the interesting things that I never did tell earlier outside of Steedumbrella group is a story: "Attempt to produce the Russian Avengers fan-film". Yes, there was case, and now it is time to tell this story. Since 1997, the work of Russian fan group Steedovtsy (first name of our community) began to take some momentum with respect to the diversity of products Avengers. If in 1996, it was limited only fan-stories, fan-comics and recordings of TV episodes on audio tape, then in 1997, there began to appear the test questions, satirical images, audio books based on our fanfics and other things. Since the spring of 1997 we started making amateur comedy videos, two of which were shown in the college in 1998. The idea to make an amateur Avengers film started to soar in my head about the same time, and although I did not share own thoughts about it with my colleagues, I think they felt it, because there were hints that if the take attempts to do producing of something such as The Avengers, it is unlikely to be possible, that we can do something decent to watch for proper entertainment. So, years passed and the idea of creating the fan-film gradually subsided. The situation changed dramatically when in 2009 was launched a Russian Avengers site, it became the basis for a new burst of creative enthusiasm of the group. There started flashing the various ideas to such extension, that it could be expected any Avengers fan-product. Can we should to revive old times and to film some humorous series, then post on YouTube? Yes, then we normally had fun, now I would have played more better. This post has inspired me to debate with Aleksei Sidorov on possible plans for the production of a comedic video series in the old spirit, to which he responded in the negative, saying, "I see no reason to repeat traveled, we need a completely new project and more serious approach to producing". Yes-yes, good words, it pushed me to the fact that the first time I expressed aloud my thought about making the Avengers film, absolutely not anticipating what the Aleksei's reaction would be. To my surprise, he agreed without hesitation, and immediately plunged into the plans for production. Ha. Memorable moment. The future script of the film in genre parody (we have agreed that in this sense we have a chance to make a good production that in case successful development can serve to capture serious fan-film) will be shot in three versions, the differences which consists in the fact that the characters will be played by different actors. In the first version, Aleksei Sidorov would have played John Steed, while other Aleksei and I played his partners or other roles. The second version, I would have played John Steed, while both Aleksei played other roles. The third version - obvious. The screenplay was decided to written in a way that would at first I made a draft of script, and then Aleksei Sidorov would have edited it to the fit form. Sergey Pronin was attached to the category of director, cameraman, and lighting designer (he was a real expert in these areas) while the assistants of director were Aleksei Sidorov and me. Aleksei Sidorov was also attached to the costumes, while I would have acted as a choreographer and film editor at the final stage. Somewhere in December we came to the flat of Sergei Pronin and made a test video. We decided did not use special suits or any accessories for the test, every was dressed in usual characteristic style and Sergey Pronin took video of us individually and collectively. As result it became clear that John Steed should to play exactly Aleksei Sidorov and future plan for three versions of film turned in one version. Everything was going fine since this point, I speculated on plot of story, enthusiasm was in the air, until the failure to continue the work did not happen on one seemed little reason, which put the project on the shelf. When we were ready to make a video properly for opening titles of parody film, Aleksey Sidorov unexpectedly came to the decision that we need the actress in the role of Mrs. Peel. This meant to revise the story. By the way, about the female character - I thought about Ira Goncharova. Sadly, I came to her on the page VK, she is not there for a long time ... but we need a girl for the role of Mrs. Peel !!!! It is necessary to create a parody of fine, elegant and cool titles of series ... must think!!! I thought the girl in the episode is not necessary ... in fact, on current stage I seen something like a parody in the spirit of Benny Hill. 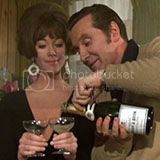 For example, as for Mrs. Peel, it maybe will be interesting if to do that viewer is waiting to some woman on screen as partner of Steed, but appears Aleksei Arsent'ev. In further correspondence, our opinions began to split - until Aleksei wanted me to find a way to contact with Ira for offering the role of Mrs. Peel, I was opposed to her candidacy, although in general agreed to the solution that we could would use someone as Mrs. Peel. We started thinking about the candidates and a new incarnation of the film and could not come to a common denominator. In the end, I agreed to Ira as Mrs. Peel, that only not to interrupt work on the film, but fate - we have not been able to contact her. Yes, the problem of the production laid in this ridiculous reason - different candidates that I offered to Aleksei did not fit to him, after again I tried to convince him that we can do film without any girl at all, as a result, I realized that we have to wait. I knew that Sergei Pronin would not make the movie without the participation of Aleksei Sidorov, so even though I was burning enthusiasm, I did not see other variants other than the one to make a stop. I did no know other people in Russia, with which I could make a good Avengers fan film. Since the project went on the shelf. Thanks for sharing that Denis. The idea of making fan films is very interesting, but there are practical reasons why it's seldom done. Forum communities are great for bringing people together around a shared interest, but a problem exists when this needs to be translated into the real world because members are distributed throughout the globe, so it can be difficult for people to come together to actually do anything. Technology though can come to your aid: namely, the video green screen process. This means backgrounds (which, depending on the situation, can be still images as well as video material) can be used and the actors are filmed in one place against a green screen, later to be composited into the location in post-production. Therefore the backgrounds could be contributed by the forum community by emailing still images or uploading video clips through a free file transfer service. The live action shooting can be condensed into a relatively short shooting time and benefits from an ideal sound recording environment, compared to usual location shooting. A green screen Avengers film would allow a period setting (for example, you can add photographs you have taken of 1960's cars) which is normally beyond no-budget projects. The distinctive Avengers deserted street scenes could be done with stills, those with Photoshop skills could try recreating Steeds flat from base images, or creating some good fantasy locations from montaging different images together to make some suitably way-out locations. However, the green screen method needs someone who knows how to light for it to get a good edge on difficult areas such as a person's hair. And in post, every shot is an effects shot, so compositing will take longer than a normal video edit, and you need someone who really knows what they are doing. As with any video project, it needs lots of preparation. If you've seen the fan recreation of an unfilmed Danger Man episode that would seem an obvious aesthetic to follow - a combination of snippets from original episodes and a careful recreation of the opening and closing credits. It works surprisingly well, although the audio quality sometimes lacked - as is often the case in these things. Audio needs to be redubbed, and make your actors work that script! A bad line makes a film bad.